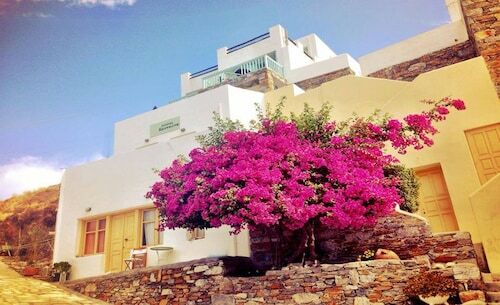 Secure a Kithnos holiday package on Expedia right now! This is by far one of the easiest ways of saving time and money for your awesome getaway. Up to 15%* can be saved when you book your package deal on Expedia. With more than 400 partner airlines and 321,000 properties to choose from on our universal database, you won't have any problems designing your dream holiday. Feel free to cancel or make changes to almost any booking and you won't pay a cancellation fee to us. Almost ready to jet off on your Kithnos holiday? Don't know what sorts of things to put on your travel programme? No need to stress — we're here to give you some of our top tips. A beautiful arc of land and sea, Loutra Bay will relax and revitalize your spirit. Inquire into boat tours if you want a better perspective from the water. Still got some time on your hands? If you're in the mood for a little spiritual enlightenment on your travels, stop by Church of Panagia Kanala. You never know, you may even glimpse the answers to a couple of life's biggest questions! On your way to Kithnos? It'd be wise to book a room for your luxury getaway or cheap holiday as soon as you can. There are only 6 properties available. 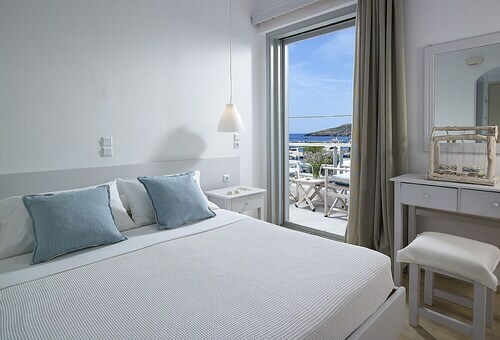 Begin your holiday on an opulent note by sliding between the soft sheets at the S4 Sun by K4 Kythnos (Kanala). Alternatively, the Kythnos Bay Hotel (Loutra, Cyclades) is a terrific place for the budget-conscious traveller to spend their nights. Nearly ready for your trip to Kithnos? Wondering where you'll be flying into? Eleftherios Venizelos Airport (ATH) is your closest terminal. Once you've hit the tarmac and found your way out of the arrival gate, you'll be 45 miles (72 km) from the bustle of the main areas. Located in the heart of Kithnos, this apartment building is 0.1 mi (0.1 km) from Port Merichas and within 9 miles (15 km) of Church of Panagia Kanala and Loutra Bay. Gialiskári Beach and Kea Port are also within 32 miles (52 km). Situated by the sea, this hotel is 0.1 mi (0.1 km) from Loutra Bay and within 12 miles (20 km) of Port Merichas and Church of Panagia Kanala. Situated in Kithnos, this hotel is 2.5 mi (4.1 km) from Loutra Bay and within 9 miles (15 km) of Port Merichas and Church of Panagia Kanala. Kea Port and Saint George Church are also within 32 miles (52 km). 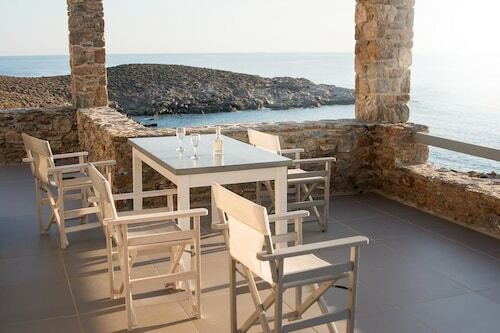 Situated in Kithnos, this aparthotel is 0.1 mi (0.2 km) from Port Merichas and within 9 miles (15 km) of Church of Panagia Kanala and Loutra Bay. Gialiskári Beach and Kea Port are also within 32 miles (52 km). 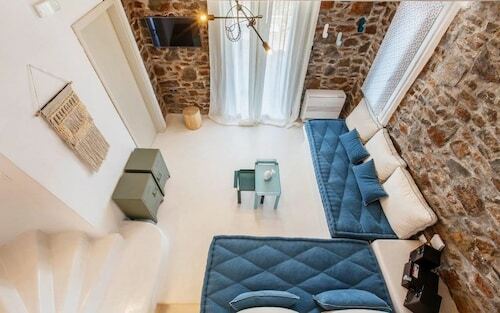 Situated in Kithnos, this apartment building is 3.8 mi (6.1 km) from Church of Panagia Kanala and within 12 miles (20 km) of Port Merichas and Loutra Bay. Agios Nikolaos Lighthouse and Gialiskári Beach are also within 32 miles (52 km). 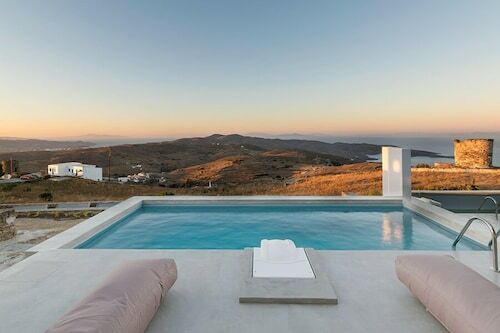 Situated in Kithnos, this villa is 3 mi (4.9 km) from Church of Panagia Kanala and within 9 miles (15 km) of Port Merichas and Loutra Bay. Kea Port and Saint George Church are also within 32 miles (52 km).